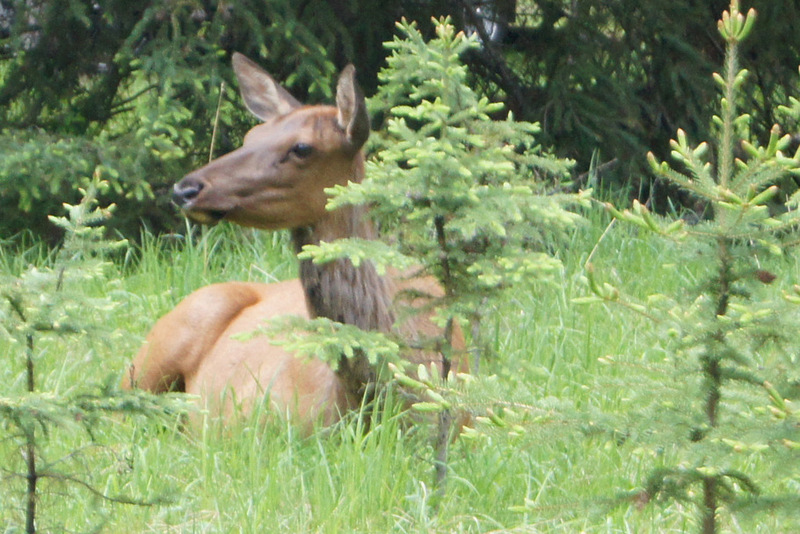 Blondie and I were surprised to find an elk next to the dumpster in the campground as we made our morning walk! I didn’t even see her until we were very close to her. What a great way to start the day! The rain started coming down as we were ready to go out and explore the area. The town of Jasper has a few blocks of restaurants and shops. We enjoyed a nice breakfast at LuLu’s Cafe and did a little shopping at an outdoor outfitters shop. We had the same idea as many other people and went to the Visitor’s Center to check email. The place was packed with many people checking their phones, computers, and tablets for news from home. The connection was slow so we gave up and decided to go on a drive recommended by the clerk at the outdoor store. Bear are frequently sighted on the Marmot Basin drive so off we went in search of bear. The narrow road climbs to a ski area which is closed for the season. It winds beside rivers and lakes with views of the mountains. There were no bears but it was fun looking. At the end of the road we came to Athabasca Falls. There are easy walking trails for exploring both sides of the falls. Four elk awaited us at the entrance to our camping loop when we returned. They were resting in the grass around two empty campsites. Such a great way to end the day! We were greeted by elk in our camping loop as we returned from the drive.